Nylon is a manufactured fiber in which the fiber forming substance is a long-chain synthetic polyamide in which less than 85% of the amide-linkages are attached directly (-CO-NH-) to two aliphatic groups. Nylon is a synthetic polymer, a plastic, invented on February 28, 1935 by Wallace Carothers at the E.I. du Pont de Nemours and Company of Wilmington, Delaware, USA. The material was announced in 1938 and the first nylon products; a nylon bristle toothbrush made with nylon yarn (went on sale on February 24, 1938) and more famously, women's stockings (went on sale on May 15, 1940). Nylon fibres are now used to make many synthetic fabrics, and solid nylon is used as an engineering material. The term nylon refers to a family of polymers called linear polyamides. 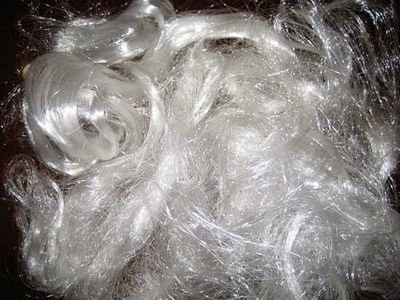 There are two common methods of making nylon for fiber applications. In one approach, molecules with an acid (COOH) group on each end are reacted with molecules containing amine (NH2) groups on each end. The resulting nylon is named on the basis of the number of carbon atoms separating the two acid groups and the two amines. Thus nylon 6,6 which is widely used for fibers is made from adipic acid and hexamethylene diamine. The two compounds form a salt, known as nylon salt, an exact 1:1 ratio of acid to base. This salt is then dried and heated under vacuum to eliminate water and form the polymer. In another approach, a compound containing an amine at one end and an acid at the other is polymerized to form a chain with repeating units of (-NH-[CH2]n-CO-)x. If n=5, the nylon is referred to as nylon 6, another common form of this polymer. The commercial production of nylon 6 begins with caprolactam uses a ring-opening polymerization. For a detailed production flowchart, go here. In both cases the polyamide is melt spun and drawn after cooling to give the desired properties for each intended use. Production of nylon industrial and carpet fibers begins with an aqueous solution of monomers and proceeds continuously through polymerization, spinning, drawing, or draw-texturing. Apparel: Blouses, dresses, foundation garments, hosiery, lingerie, underwear, raincoats, ski apparel, windbreakers, swimwear, and cycle wear . Tire cord, hoses, conveyer and seat belts, parachutes, racket strings, ropes and nets, sleeping bags, tarpaulins, tents, thread, mono filament fishing line, dental floss.